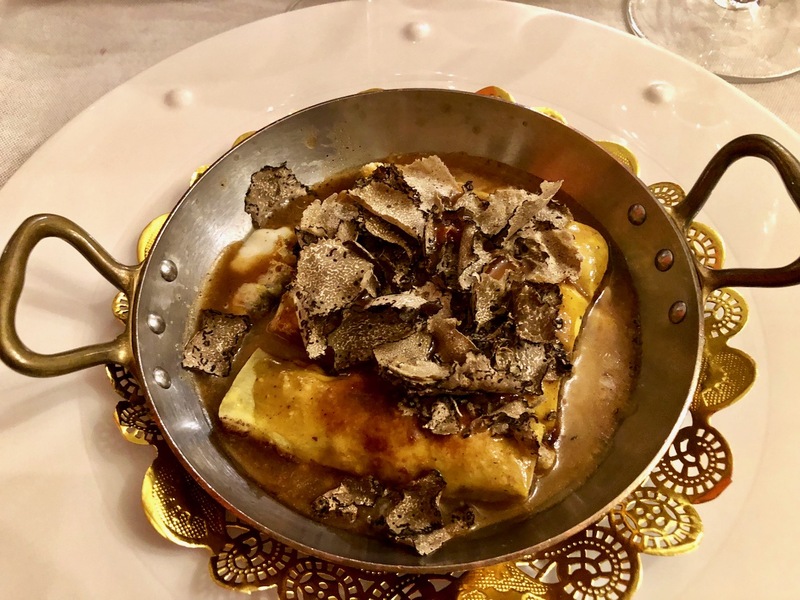 Long before we left for Italy and knowing we would be there at the beginning of White Truffle Season, I decided we should end our four days dining at a very special restaurant. 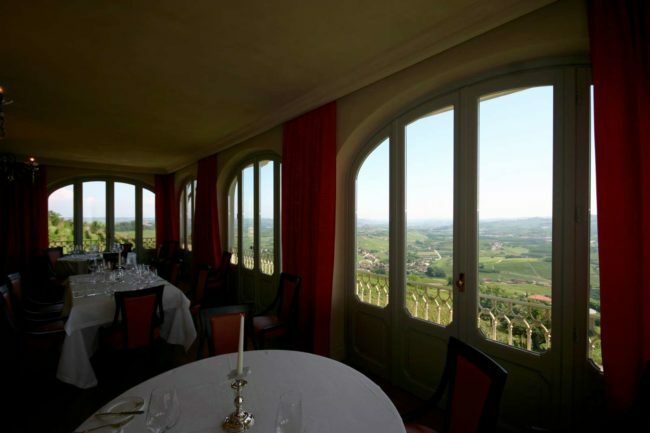 Of course, never having been to Piemonte, what should that restaurant be? After researching site upon site, I came to the conclusion there was only one choice … Bovio in La Morra. To make sure we secured reservations, I made reservations seven months in advance. Yes, you read that that correctly … seven months! Some things you don’t leave to chance. 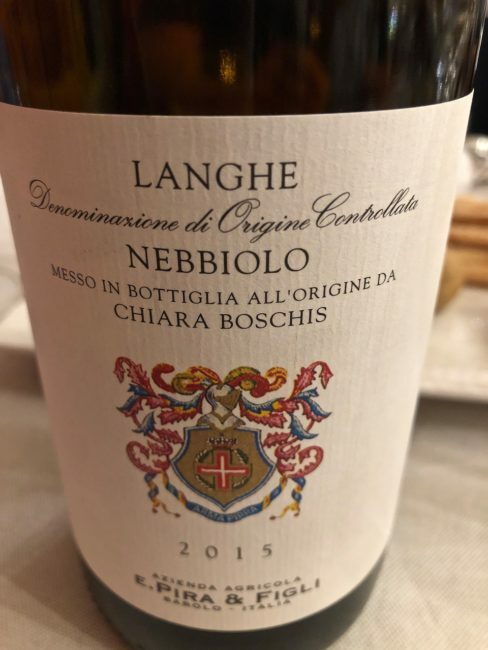 Bovio is nestled in the vineyards just below La Morra with magnificent views over the Langhe countryside, but since it was already dark we were only afforded views of the lights of the valley below. That was fairly spectacular in itself. 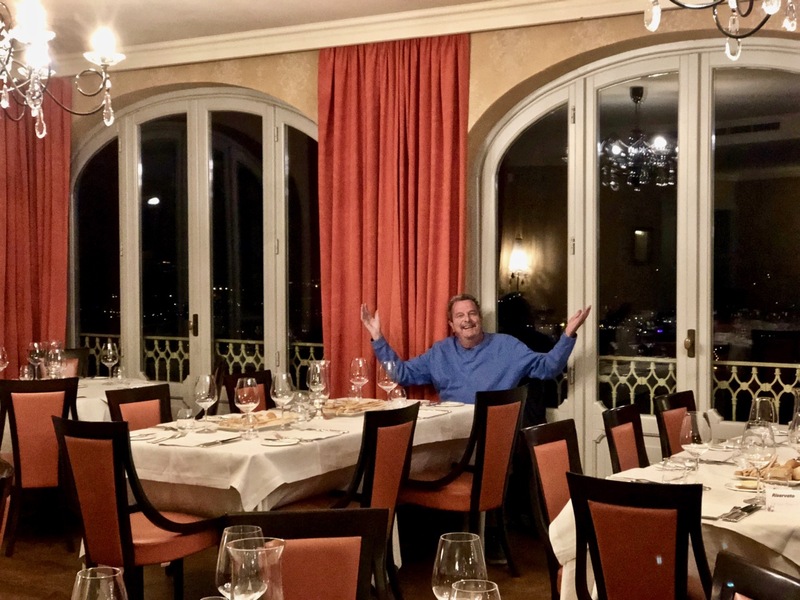 I had requested a terrace table, but on this night the weather proved to be uncooperative with reports of a rain storm headed our way. Arriving a little before 8 p.m. for our reservation, it appeared we were among the first to arrive (our usual MO). Tracy loves watering cans. 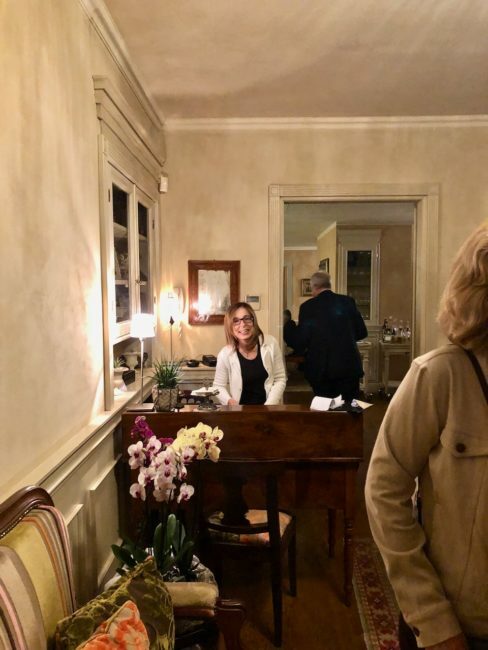 … where I welcomed our guests to the table in my usual subtle manner. 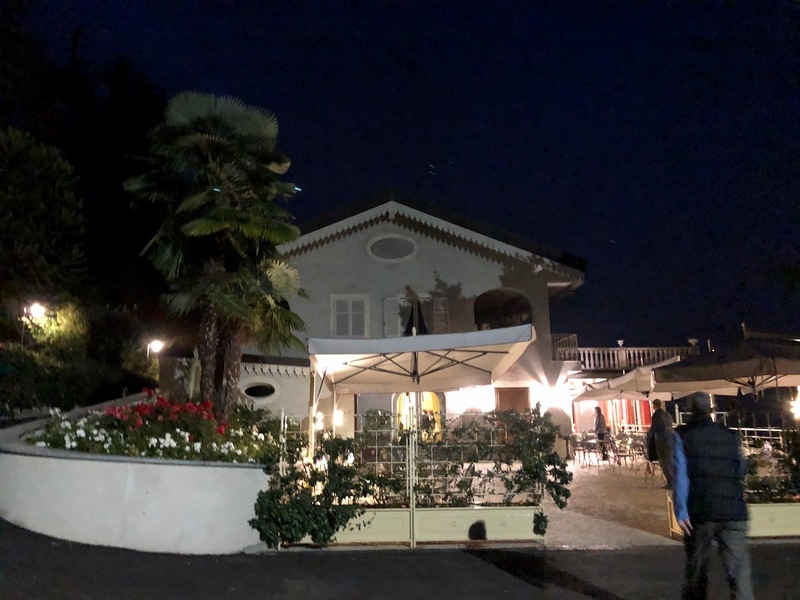 I had read earlier that the Bovio family (“one of the oldest families of restaurateurs in Piemonte”) had previously owned another restaurant for 40 years ( Ristorante Belvedere), but had desired a more “intimate locale,” so they chose this panoramic spot in La Morra (photo below of terrace on a summer night from Bovio website). 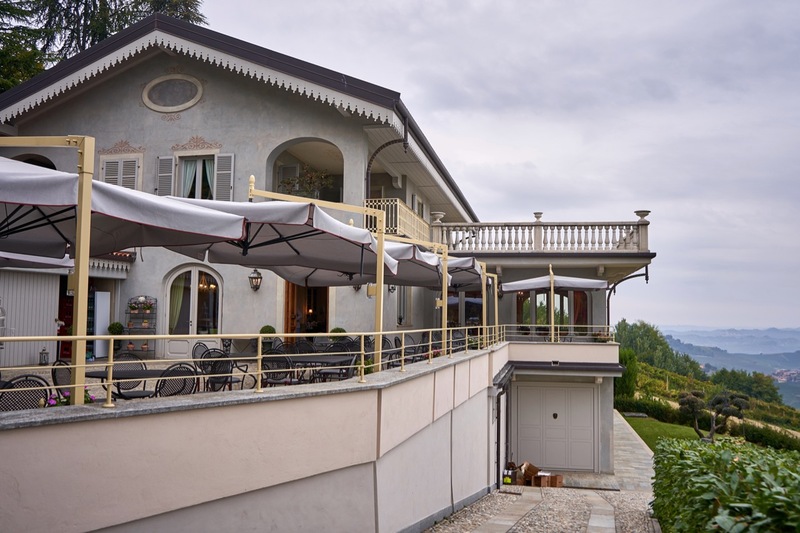 Glen Bovio and daughter Alessandra run the dining room (check out this sweet view courtesy of the Bovio website). 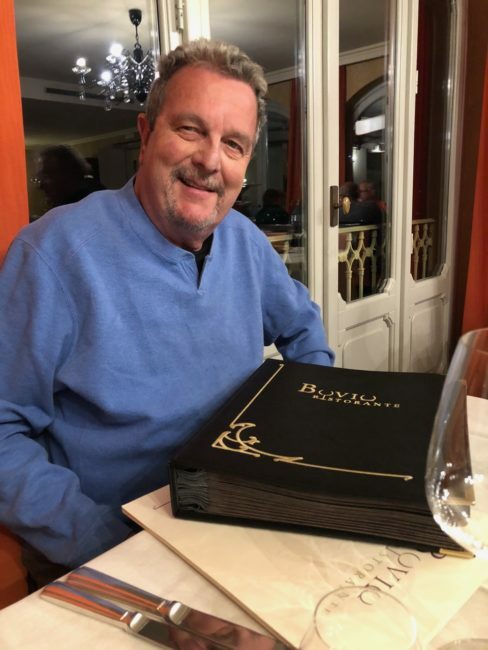 A huge wine list was delivered to our table, larger than any I had ever seen. As it turned out, this was the War and Peace of wine lists, bigger than any book I read in college (or since). In fact, the restaurant has more than “1,000 local and national labels,” with 1,000s of bottles in its cellar. Knowing we didn’t have time to drink them all, Tracy and Mary opted for a bottle of Prosecco, while the rest of us shared a bottle of Nebbiolo and a Barbera. We might have ordered another later. 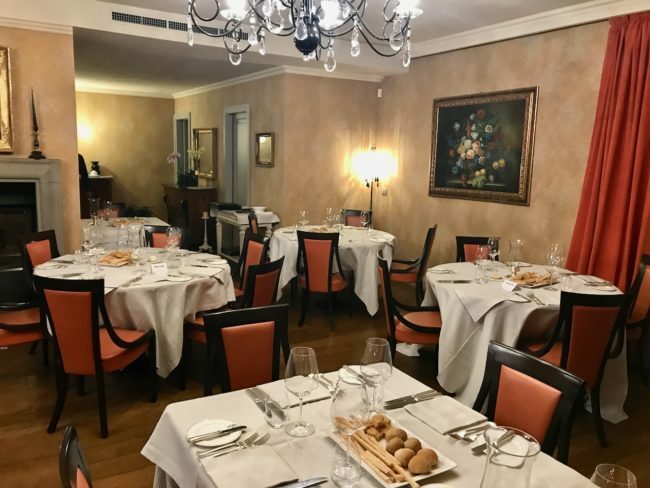 The dinner menu had a number of delicious sounding choices .. and on this evening Bovio also provided a much more expensive White Truffle menu, which we passed on (initially). As we perused the menu, looking up we noticed the restaurant was now completely full. To start, Kim and I started with the Gnocchi di patate rosse al Castelmagno; Potato gnocchi with Castelmagno cheese (€15). While Kim found it a tad rich, I decided it perfect for my pasta palate. 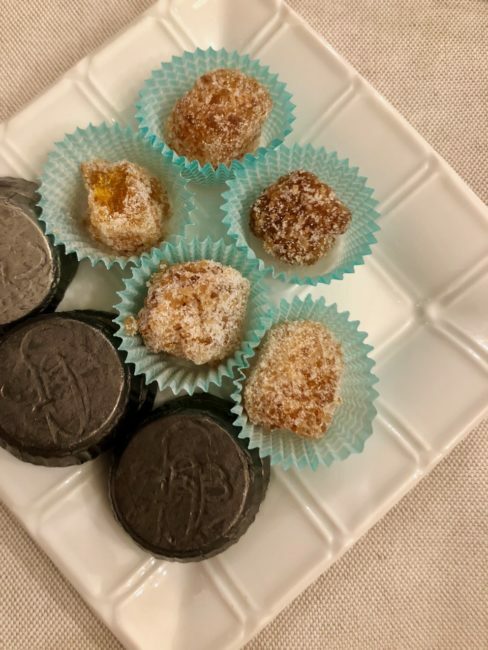 I savored every single bite. 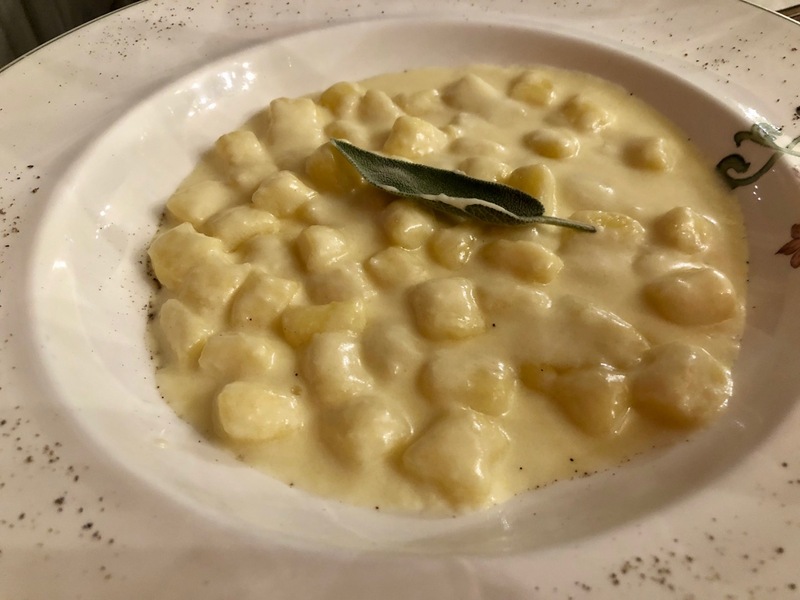 As some of you might know, I am a gnocchi aficionado, and I loved this one. 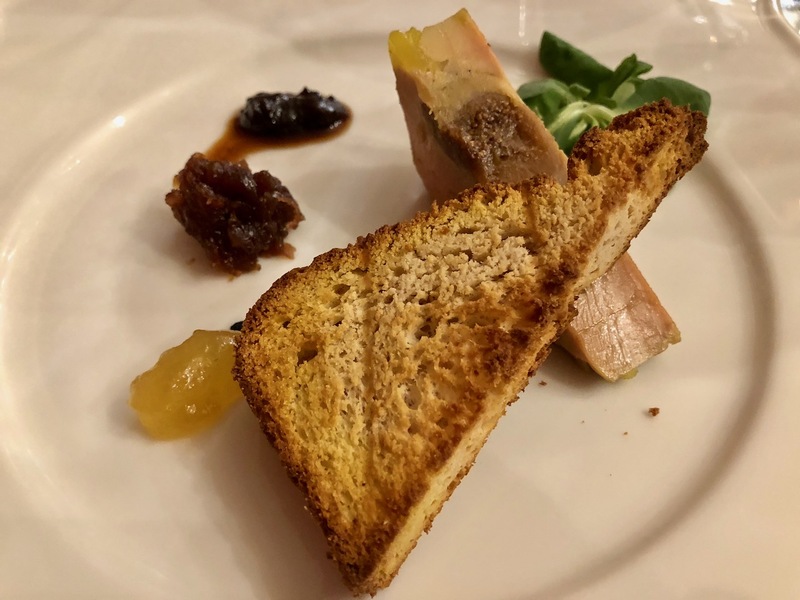 For their first course, Tracy and Gloria shared a delicious Terrina di fegato grasso di anatra ai fichi, marmellata di cipolle rosse e zenzero; Duck foie gras terrine with figs, red onion jam and ginger (€16). Mary’s appetizer of Fettuccine, squid, red shrimp and mullet was also delicious. 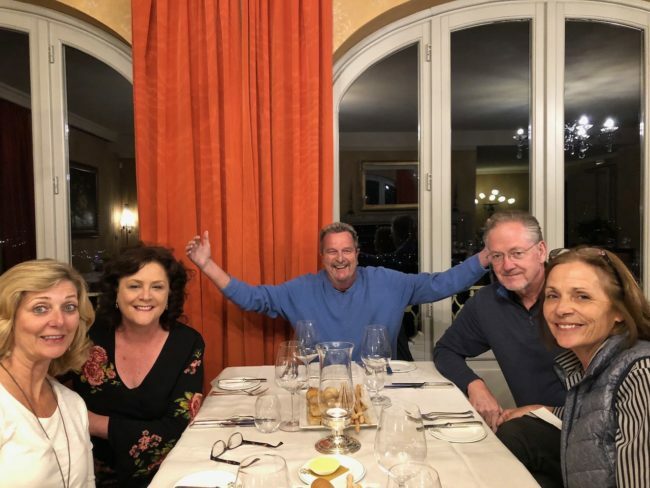 Suddenly, fate stepped in, well, actually fate stepped to an adjacent table. 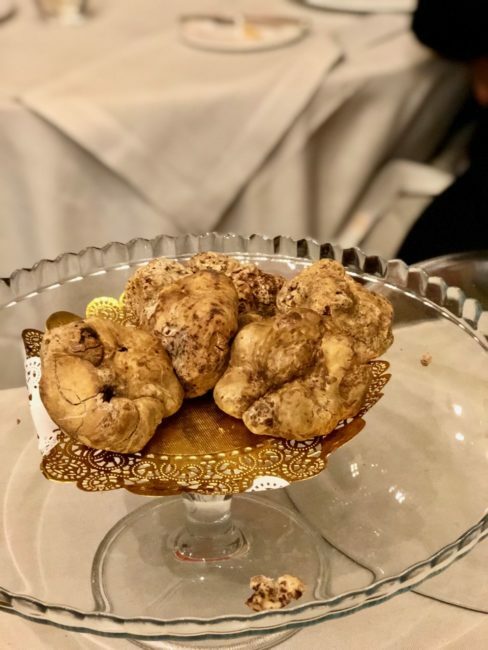 A cart carrying a small platter of white gold (aka tartufo Bianca di Alba) entered the dining room. It was too much for me. As Worf stated in Star Trek: “Resistance is futile!” We had been on a truffle hunt a few days before, yet no one at our table ordered white truffles. However, when the cart bearing fragrant white truffles was wheeled to the table next to us, the allure of the truffle was too much. I had been seduced and no one could stop me. Fortunately, I believe the restaurant made our pasta portions a little smaller, and the bill wasn’t as much as it could have been (plus the others shared … willingly, I think). 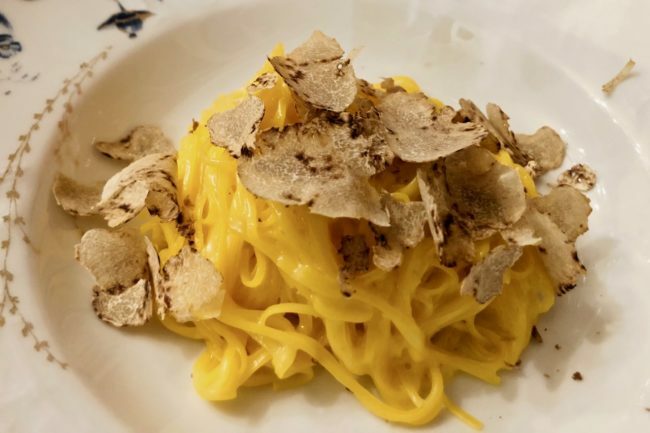 In any event, soon, sitting in front of us, with white truffle scent wafting into my inner soul, it arrived … the greatest pasta dish I have ever tasted in my life. To say I savored each and every bite would be an understatement of gigantic proportions. It’s hard to describe how incredibly delicious this dish was, and at this moment I want to thank those hens for all the red eggs they provided. I wished I could have thanked each one individually for their efforts. That was definitely a “Wow” dish and certainly ranks at the top of the many incredible pastas we consumed on this trip. 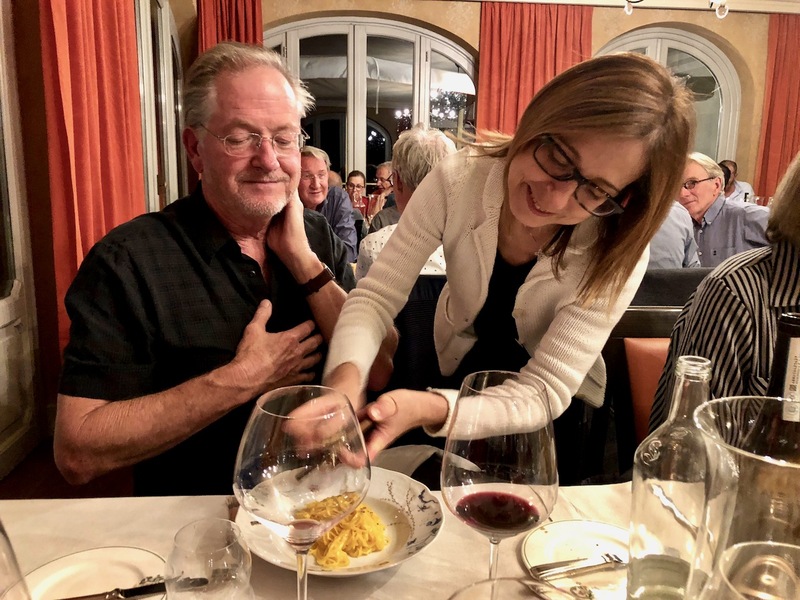 The waiter explained that the pasta is made with 40 red eggs and farina flour. 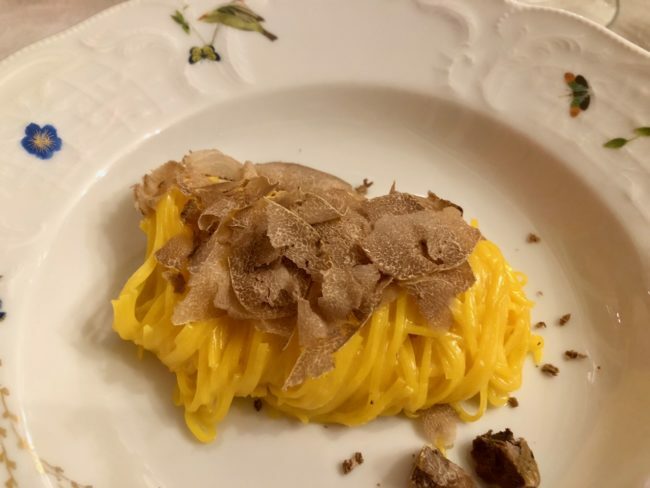 The pasta was silky and delectable and perfectly complemented the white truffles shaved on top. The presentation of the white truffles was pretty spectacular too. 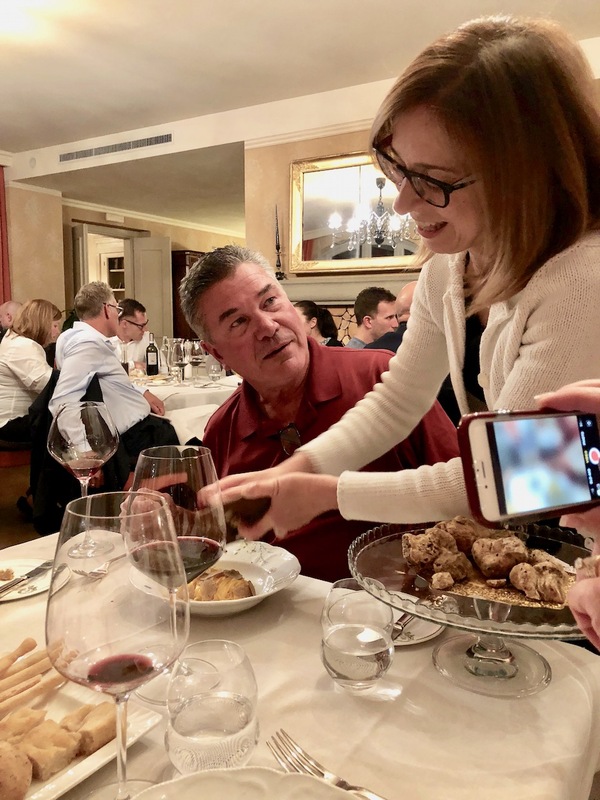 They are wheeled out on a cart and one person (who I believe might be Alessandra, one of the Bovio family owners) shaves white truffles over your pasta. When I finished, my joy was tempered by the sadness the pasta dish was now history. Tagliolini Tom, my name for but a few moments, will most certainly return. 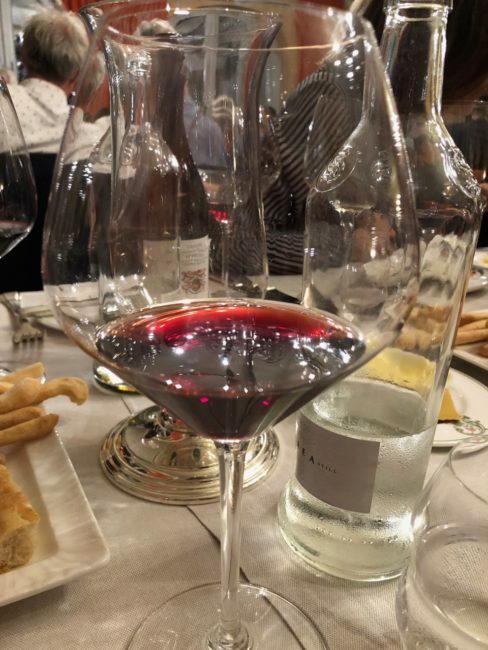 I very much enjoyed my Il classico brasato di manzo fassone Piemontese al Barolo; typical braised beef in Barolo wine sauce (€18), but I still yearned for more pasta. 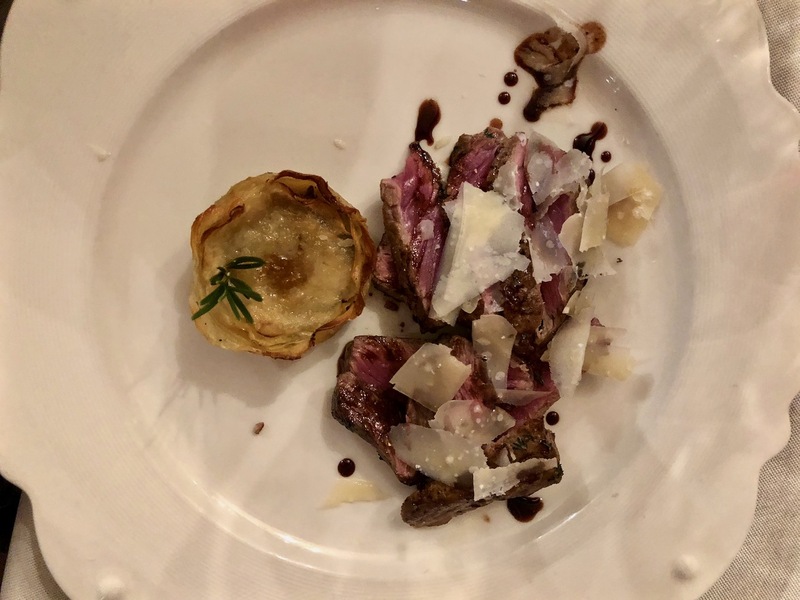 Kim decided upon the Tagliata di vitella, scaglie di parmigiamo, riduzione al Barbera e tortino di patate; Veal with Parmesan cheese, Barbera wine reduction and potato tart (€20). 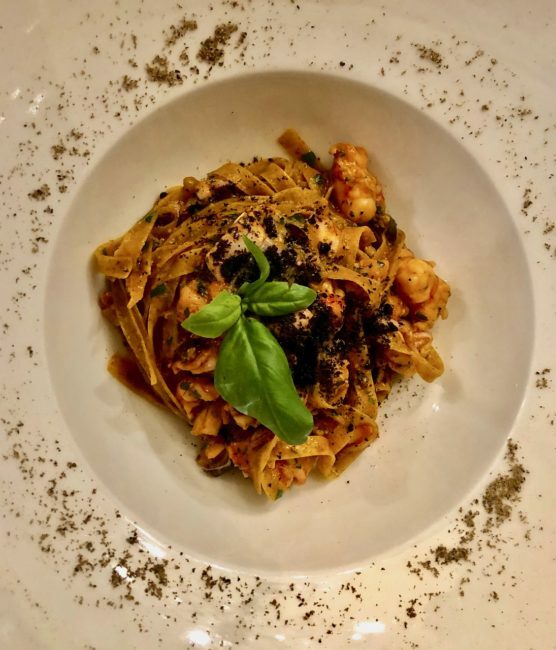 Mary dined on a terrific Baccalà su passatina di topinambur, battuto di olive, capperi e pomodori secchi; Cod, Jerusalem artichoke cream with olives, capers and dried tomatoes (€20). 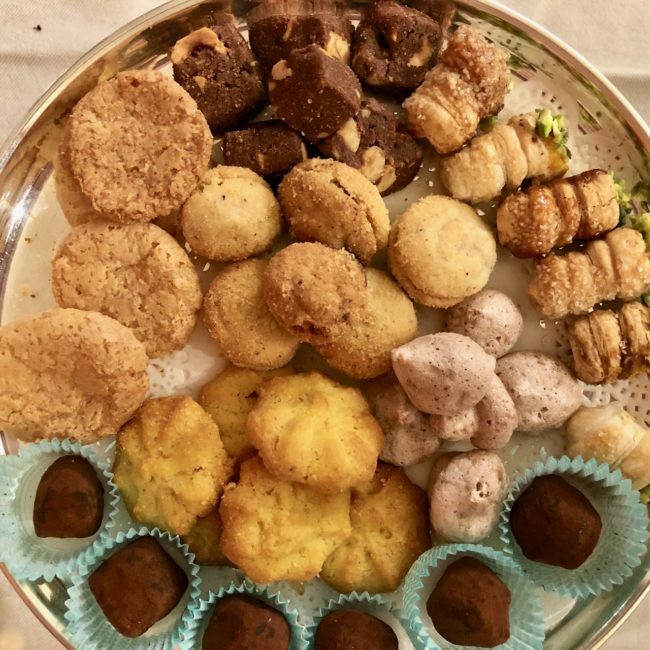 Sadly, we were too full to order one of the enticing desserts, however in what must be an Italian custom (and a wonderful custom it is) to keep patrons eating delicious food, our waiter brought out several plates of small cookies, chocolate truffles and bonbons which we somehow managed to devour. 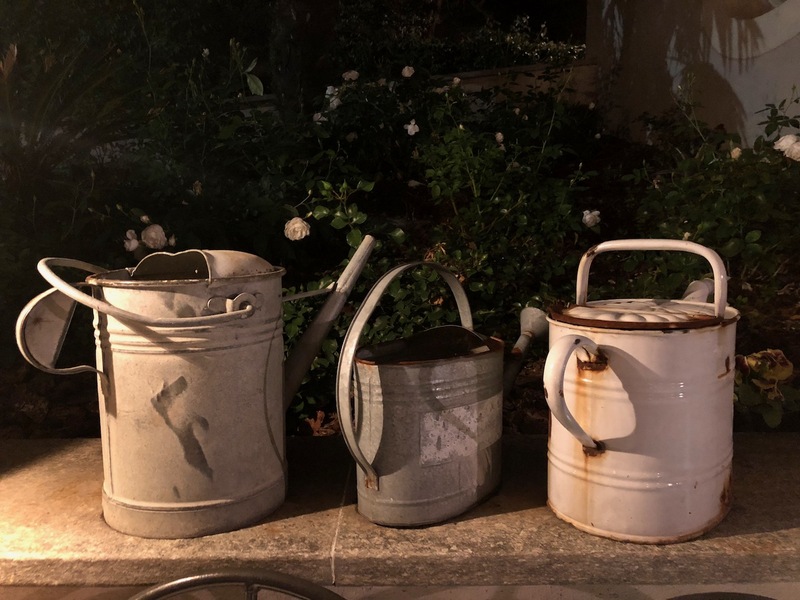 Finally satiated, we paid the bill (our entire meal including the white truffle special and wine came to €128 a couple), bid everyone “Buonanotte” and walked outside, into a fairly sizable rain event! Discretion being the better part of being soaked, Greg, Gloria, Tracy and I ducked back inside to decide what to do while Kim and Mary decided to make a run for it (well, as fast as you can run up a steep hill). We decided to follow in their footsteps, and make the trek up the hill to walk off our dinner. Besides, what’s a little rain after a perfect evening like this? As we started our walk, our server hurried out after us and offered to drive us to our B&B! There’s something that doesn’t happen in the U.S.
We politely declined, and then he insisted on getting us four umbrellas and said that we did not even have to return them. Wow! 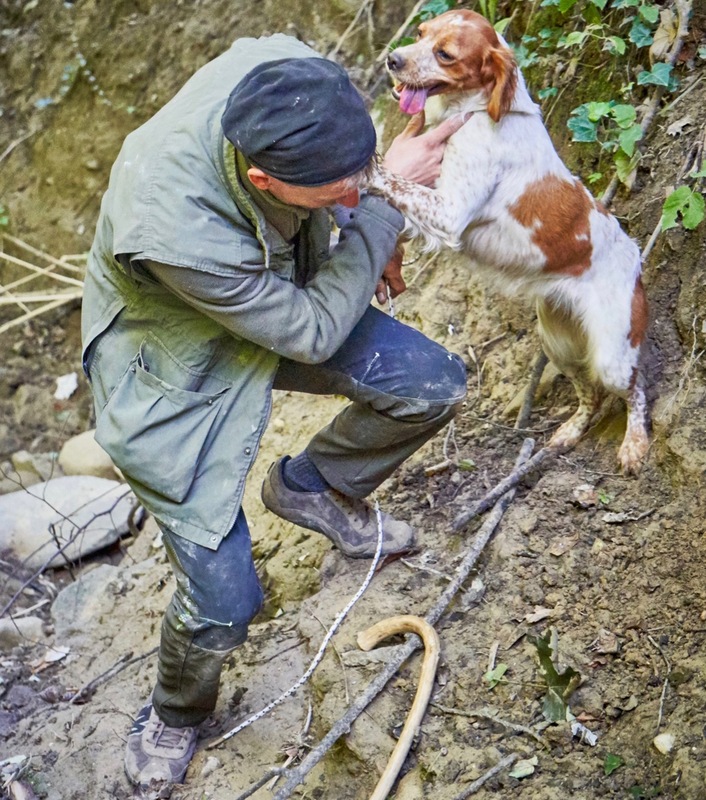 What service … above and beyond is an understatement! The four of us strolled back up the hill, twirling our umbrellas while humming Singing In the Rain as the heavy drizzle poured down on us actually making for a delightful end to our spectacular evening. 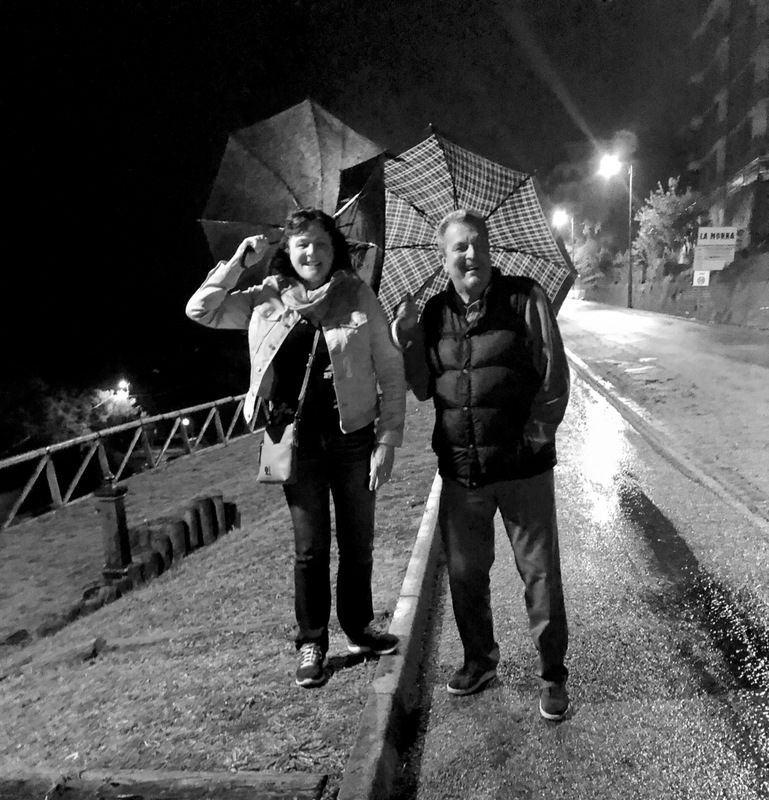 Not being umbrella thieves, we dropped them off the next morning as we drove out of town. In Europe, or just life in general, there are those magic moments that one loves to relive. Our night at Bovio was certainly one of those. 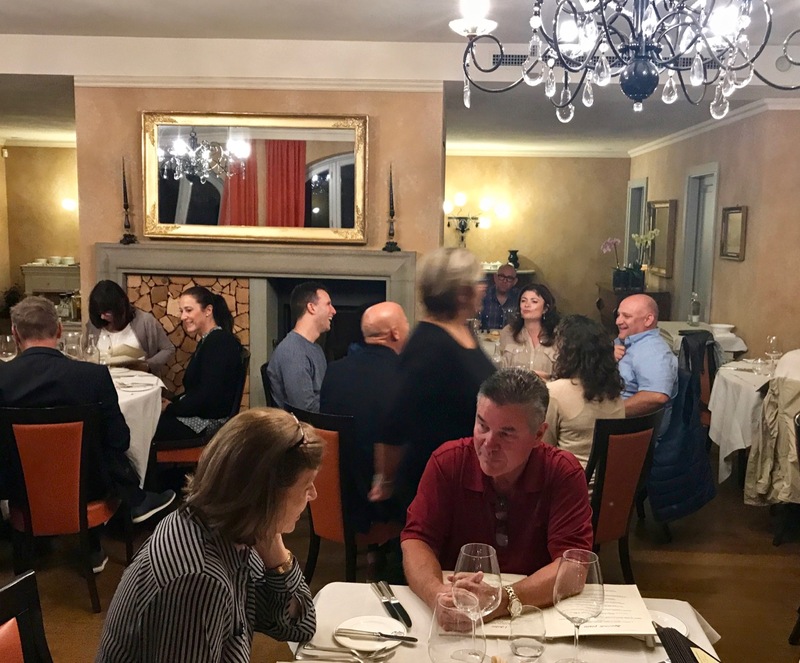 Many thanks to the staff and the Bovio family for providing an experience we will never forget. Congratulations on receiving the soon to be coveted (hopefully in my lifetime), Mai Tai Tom’s 2018 International Restaurant of the Year! 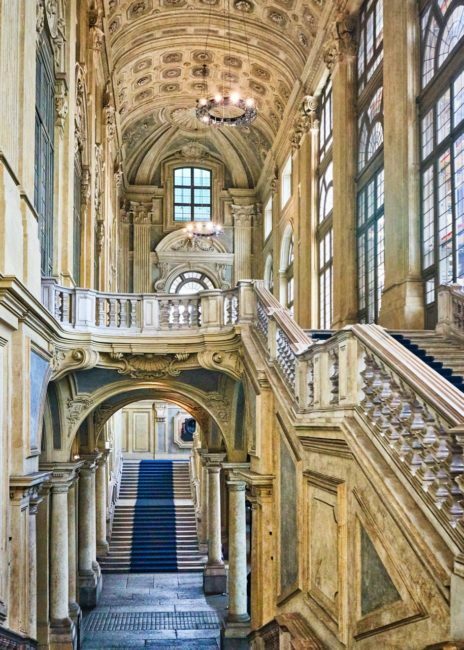 Tomorrow, we’d be off to Turin, where palaces galore awaited us. Hours: Lunch – 12:30 p.m. – 2 p.m. • Dinner – 7:30 p.m. 9 p.m.